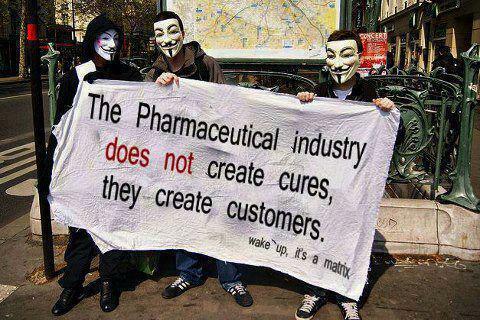 The Big-Pharma/Medical Industrial Complex, Over the last Century-Plus, has Kidnapped and Destroyed our Health! Just as Thomas Edison was little more than a structural-elite stooge, while Nikola Tesla was the true genius, so Louis Pasteur was an elite stooge or incompetent/WRONG, while Antoine Bechamp had discovered the science behind germs, disease, our bodies and health. Ever heard of Antoine Bechamp? Neither had I, until I read the following article! As usual, it is the incompetent or frauds/liars of history who have been held up (pandered) to us as our heroes. The elite-swine, who own and operate this lunatic-fringe world-system, made damn sure that any individual, having discovered something beneficial to all of mankind (Bechamp and Tesla), would be buried and forgotten, along with their discovery. If anything was discovered to help bring health, security and a long life to the average individual, and having no over-the-top monetary value, the elite-swine would immediately set out to hide and/or destroy it, and replace it with a destructive-to-us (and the planet) fraud that would guarantee them more wealth and power. We the individuals, for the last century-plus, could have had free, safe-to-us-and-the-environment energy, and a health/medical-care system that not only cured but helped to prevent our illnesses. But thanks to this tiny minority of money-grubbing pigs (the Rockefeller, Carnegie and Rothschild klans, etc), we and our parents/grandparents have always had out-of-control energy costs, a dirty, unhealthy environment, and a medical industry that seeks to keep us ill, so its elite-swine owners and operators can make outrageous windfall-profits while, at the same time, systematically exterminating the majority of we the “not fit for life”. For over a century, conventional medical practitioners – particularly in Britain and the United States – have wholeheartedly embraced without question Louis Pasteur’s (1822-95) germ theory that postulated that illness is caused when microbes invade our bodies. Pasteur believed that the human body must be protected from specific, disease-causing germs in the atmosphere that never change. 2. Your body’s electric/magnetic charge (negative or positive). 3. Your level of poisoning (toxicity). Béchamp was not your average, run-of-the-mill scientist of his day, but rather was a practicing physician AND a university professor of chemistry, biology, physics and pharmacy who had earned degrees in each one of those disciplines. Béchamp emphasized the importance of lifestyle changes such as wholesome nutrition and environmental and hygienic cleanliness as keys to disease prevention, and supported his ideas with thorough scientific precision. Moreover, he had observed that diseased tissue is symptomatic of a low oxygen environment at the cellular level and that most people are deficient in their oxygen intake. REMINDER: Sulfur is an oxygen transporter, and taking daily doses of organic sulfur helps to provide cells in the body with the oxygen they need to regenerate and repair themselves in a healthy manner. In recognizing Béchamp’s decades-long research and findings at the time of his death in 1908, the French national science journal Le Moniteur Scientifique needed 8 pages just to list the titles of his scientifically published works. Tragically, despite his impressive opus and credentials, Béchamp’s name has largely been omitted from medical, history, and biology books, while many of his discoveries have been assigned and credited to others such as Pasteur. What most people call a “disease” is really a symptom or a collection of symptoms. For example, cancer tumors are symptoms, which is why trying to fight them has resulted in the epidemic we have today. What people commonly think of as causes of disease, are symptoms. In this category are bacteria, yeast, and their descendants. When germs are involved in illness, they are producing, or influencing the body to produce, secondary symptoms. In orthodox medicine, these secondary symptoms are thought of as the disease. The answer though, lies in the condition of your terrain. Is it in balance? Unfortunately for the public at-large, Pasteur’s thesis prevailed over Béchamp’s, and the consequence is the wide deployment of patented drugs and vaccines known for their adverse side effects that are sold for considerable profit by the major pharmaceutical firms. Backed by wealthy financiers such as John D. Rockefeller and Andrew Carnegie, the American Medical Association in the early decades of the 20th century was at the forefront of shaping the course of conventional medical education and practice by aggressively promoting Pasteur’s theories over Béchamp’s and, thus, served as the catalyst that removed and discouraged alternative healing modalities such as homeopathy out of the public eye. They were so successful that by the mid-1920s, 10,000 herbalists were out of business and the number of homeopathic medical schools in existence had fallen to just two. At the same time, the major pharmaceutical firms saw a golden opportunity to make a buck and seize monopolistic control over the global drug market. Duly supported by the Food and Drug Administration – the so-called “public watchdog” – as well as influential organizations such as the Centers for Disease Control and the National Institute of Health, the pharmaceutical companies have grown to become a trillion-dollar-a-year business cartel while, at the same time, prosecuting and prohibiting anyone from using the word “cure” in association with foods, vitamins, minerals, herbs and other natural items. Diamond Foods capitulated and removed statements about the health benefits of walnuts from its website.